5 Delicious & Healthy Snack Ideas! Snacking is an effective way to fit extra nutrients into your diet and prevent overeating at mealtimes. As a health coach I always tell my clients to keep a healthy snack on hand all the time. To be prepared and one step ahead, makes you avoiding unhealthy choices as a cause of a low blood sugar. Here are some snacks that are easy to bring along and will fill you up and keep your blood sugar stable as you go through the rest of the day. A great carb source, with a good amount of protein from the chickpeas and fat from the Tahini. Make your own hummus, find the recipe here! Chop some carrots and celery sticks and serve them together with your hummus and you have a well balanced snack. 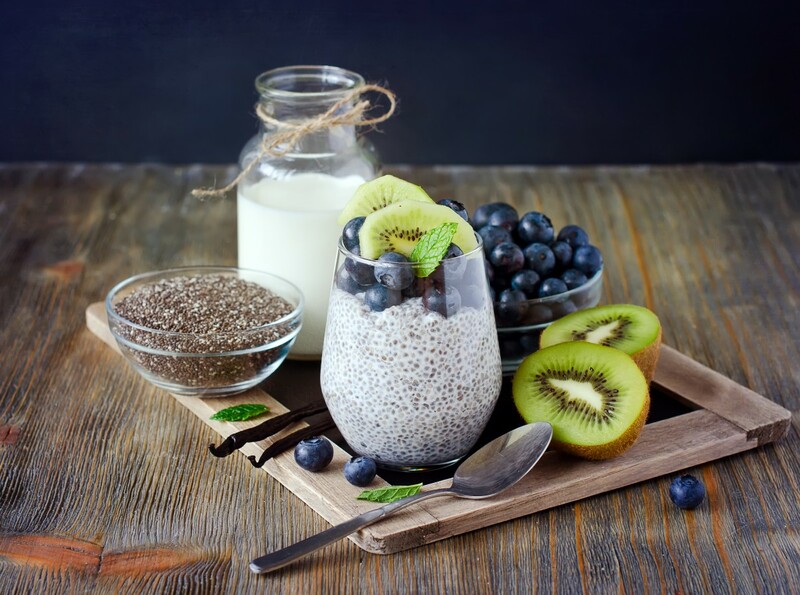 The chia-seeds are packed with Omega-3 fatty acids, they contain a high amount of fiber, which will keep you full and they are protein rich. Combine 1/4 cup almond milk and 1/3 cup water, 2 table spoons of chia seeds, a mashed half banana in a bowl. Mix well until combined and the mixture begins to thicken. Store covered in the refrigerator overnight or for at least 15 minutes. Top with fresh fruit and nuts of your choice and bring along! Keep it simple and buy a yoghurt and some seasonal berries. Protein, fat and carbs in a great combination, for a filling and satisfying snack. Probably the best snacks to eat. Buy some unsalted nuts (be careful with the serving size, nuts are as you probably already know easy to overeat). Around a handful is a good amount. Serve this great fat source, together with a fruit of your choice, to make it more filling and you will keep your blood sugar levels stable. Make a healthy smoothie or buy one at your nearest health hub. But make sure it contains a majority of vegetables and not only consists of fruits, which then can cause a way higher blood sugar, due to the high amount of fructose. For more inspirational snack ideas download the BeYou app and get your personalized meal plan!